In 1971 Porsche throws his LeMans winner title in. 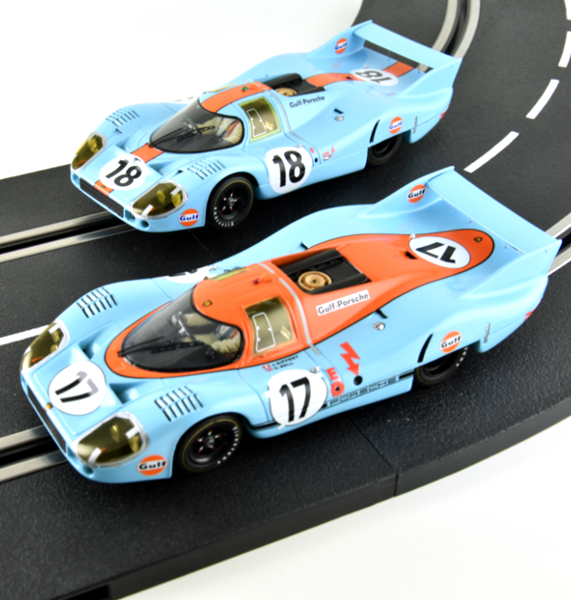 Three cars in long version “LH” are entered including two by the John Wyer Automotive Engineering Team with Gulf liveries. Car number 17 is assigned to Jo Siffert & Derek Bell.If at the end of the first hour the car is second behind No. 18, the teammates give up 6 hours before the end when they are still in 6th position. 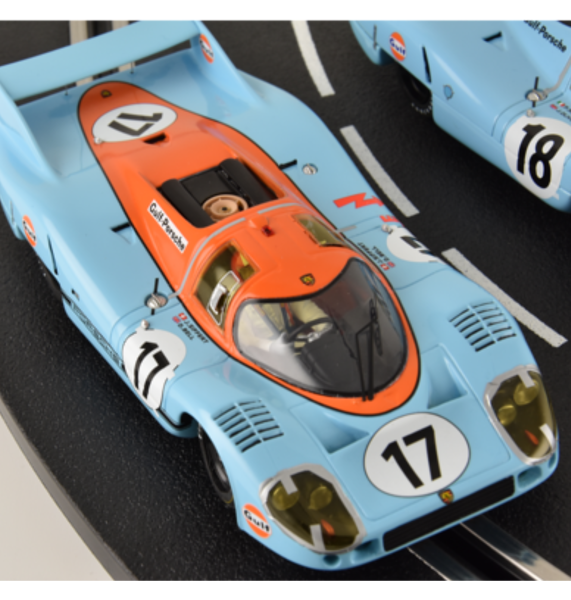 and car number 18 but it is two Porsche 917K which ends the race first and second. Here you are one of the 6 figurines that composed the Gulf team. 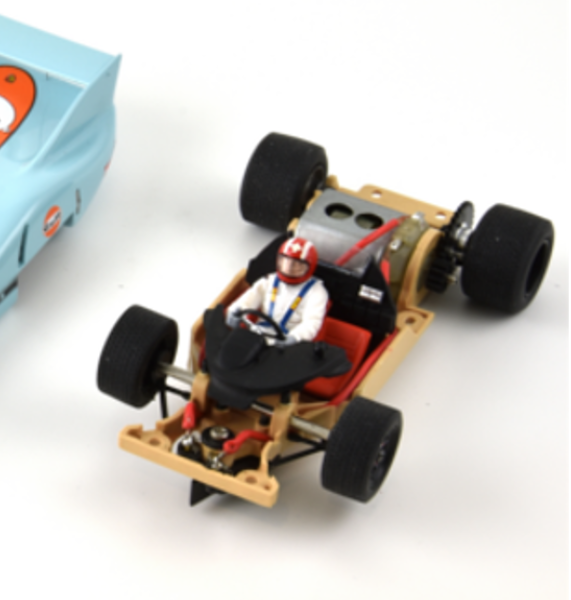 They can all be put near a lot of slot scale models of the 1960's and 1970's that are decorated under the livery of the American oil industry, Gulf. Pierre, with blue cap and moustache wears the official orange mechanic suit. Here is another team member of mechanics and technicians of the Gulf team in 1960's and 1970's. They pamper the car and push it up to the pit or on the starting line. 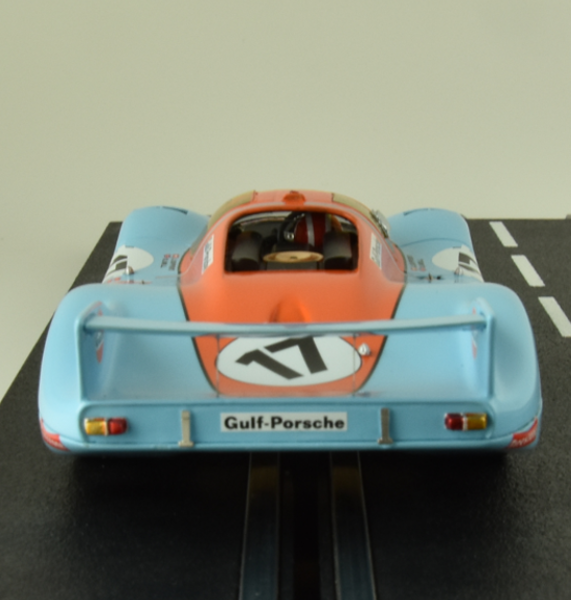 This figurine can be set near numerous slot scale models in Gulf livery of years 1960-1970. Paul, Panama screwed on the head pushes the car and also wears the orange official mechanics suit. Here is one of the 6 figurines that consists of the Gulf team. 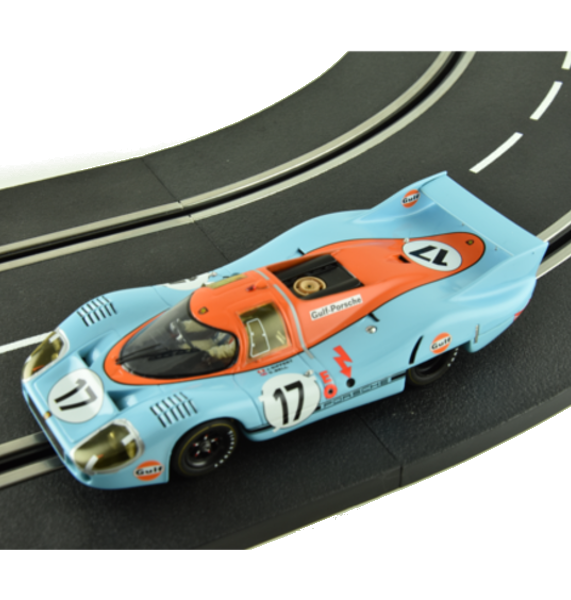 It can be set near numerous slot scale models of years 1960-1970 under Gulf livery. In same situation as the others mechanics, Jacques, both hands in front, pushes the car. The fifth element of the Gulf team, this character who is not dressed under the colors of the American oil company can be staged in numerous dioramas. His posture and his standard clothes can cover several decades. Henri wears a dark pants, a white shirt and Panama. He is the team manager. Another Team Gulf mechanic in charge of pamper and drive the car in the different places of car park to make the regulations and the necessary repairs there. Philippe is the last one of four mechanics of the team who push the car. He wears sunglassed and beige Panama and the official orange suit of the team. 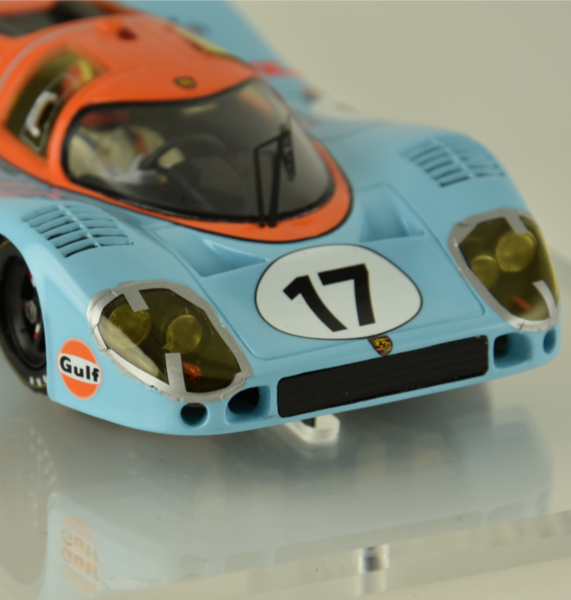 This figurine takes part of the Gulf team although it is not exactly under Gulf team livery. It can be set near a lot of slot scale model of years 1960-1970. Jean is standing in front of the car. He wears trousers, shirt and sleveless jacket. The car number can be added on the back of his jacket. He is not strickly speaking member of the team. He is a technical scrutineer, in charge of following the car. He hold the file contiaing the technical information and official papers to enter the car into the race. Pedro Rodriguez is a Mexican driver who from 1958 until his death in July, 1971 participated in all the LeMans 24 Hours events. 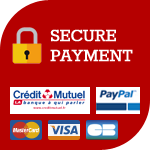 Whether it is for Ferrari, Porsche or Ford with whom he wins his first and only victory in Le Mans in 1968 with the Ford GT40, his talent is indisputable. He pursued for a long time at the same time pilot's career of Formula 1 and endurance. He dies a few months before his rival and team-mate Jo Siffert on the circuit of Nüremberg. When he was not helmeted to race, we recognized him by the cap in tartan of Sherlock Holmes. We found relevant to represent him with this strange hat and his helmet in the hands as we were used to see him in the paddocks.